It’s been a few years since I went to an event thrown by Drink Craft Beer, but when I saw that they were hosting a beer AND BBQ fest, I knew I wanted to be part of it. A bunch of my friends and I hastily bought tickets to the event, which quickly sold out. 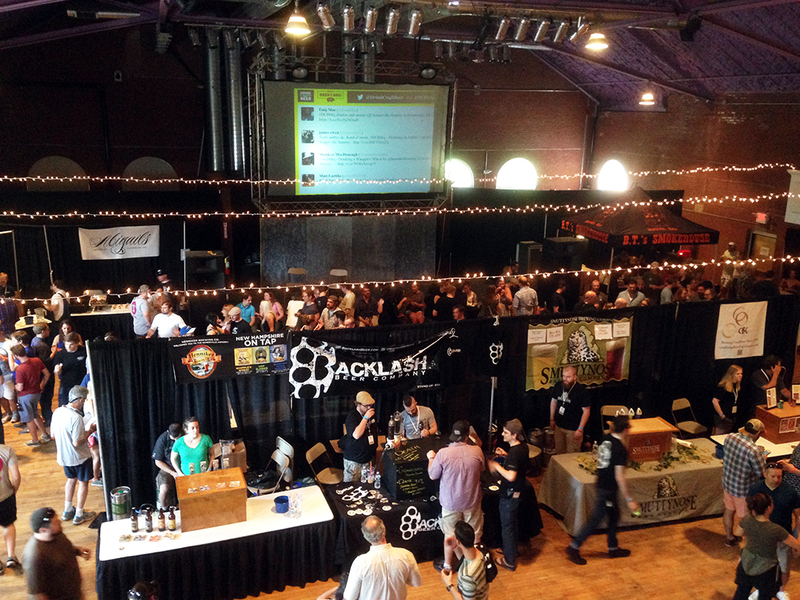 This time around, the fest was held in Somerville, MA at a much smaller venue than the usual space in downtown Boston. I noticed that a lot of breweries returned to the fest that were there in previous years, but there were also some new breweries as well as new beers that are really what make the event special. I’m often on the hunt for great BBQ and in Massachusetts it is really hard to find. I’m happy to say that after trying some of the food from the restaurants at the Beer Fest, I did finally find some incredible barbecue that even a true Southerner would tip his hat to and do a little jig. The review below starts with the food (this is a food blog after all) and ends with the beers even though the truth is that I started right away with the beers and ended with the food at the event. We all know that beer is exciting enough on its own, but what really drew me to this Beer Fest in particular was the promise of local BBQ restaurants attending. Anyone from Massachusetts or the surrounding area knows that while there is just so much good food around, we just haven’t nailed BBQ across the board. Even in Boston, it is pretty hard to find BBQ that rivals that of the South (especially Texas!). That’s why I was especially excited to try some food from local Barbecue restaurants to see if any of them can live up to the standard of truly good BBQ! 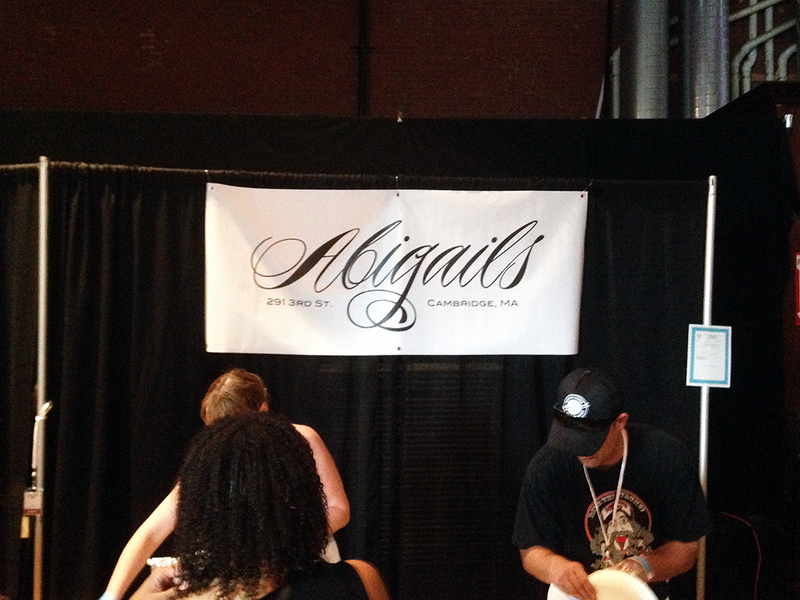 There wasn’t much to see at Abigail’s table until I looked closer. 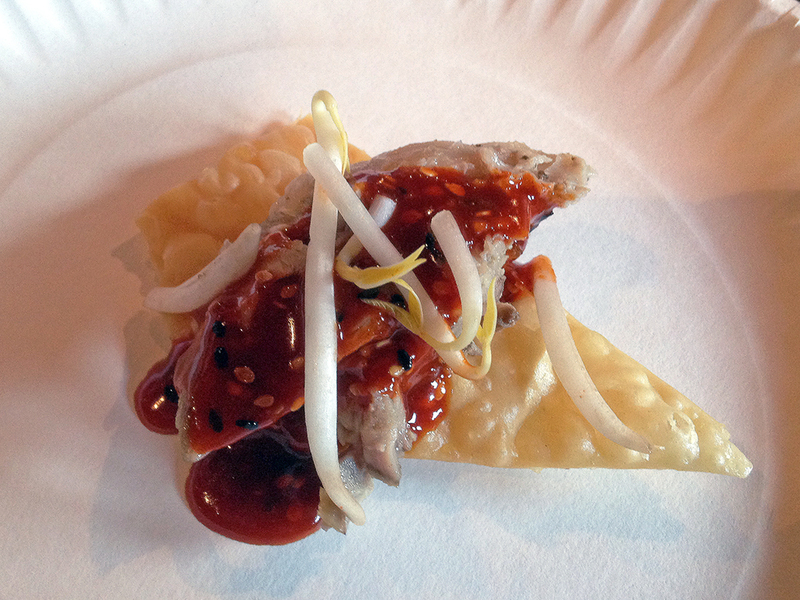 Upon further inspection, their sample featured a piece of pulled pork on a crispy puffed wonton with a really excellent Korean BBQ sauce (not a Teriyaki sauce). The pork itself was nice, but the star was the Korean-style sauce, which took an ordinary BBQ item and made something new with it. 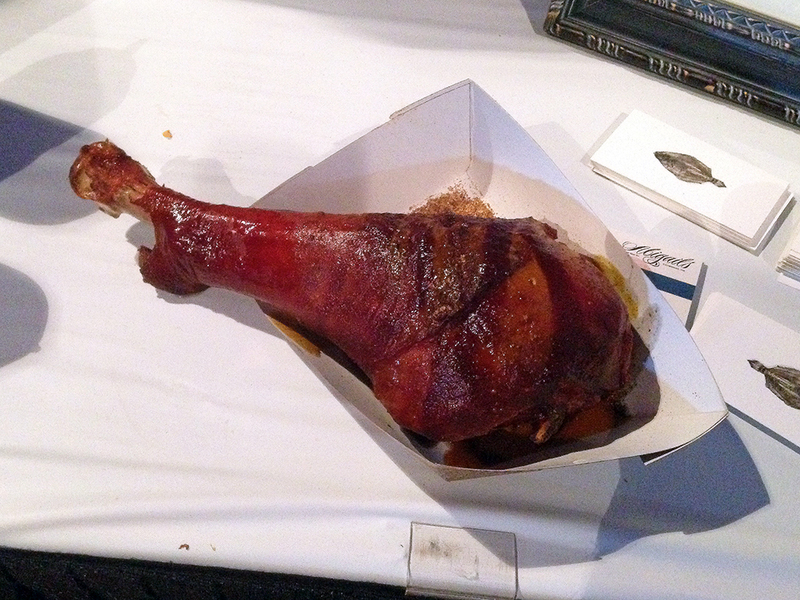 The other item at the table for sale was a turkey leg that I didn’t get to try, but it looked awesome. I’d love to know if anyone tried it and what it tasted like because I didn’t sucker any of my friends into buying one. 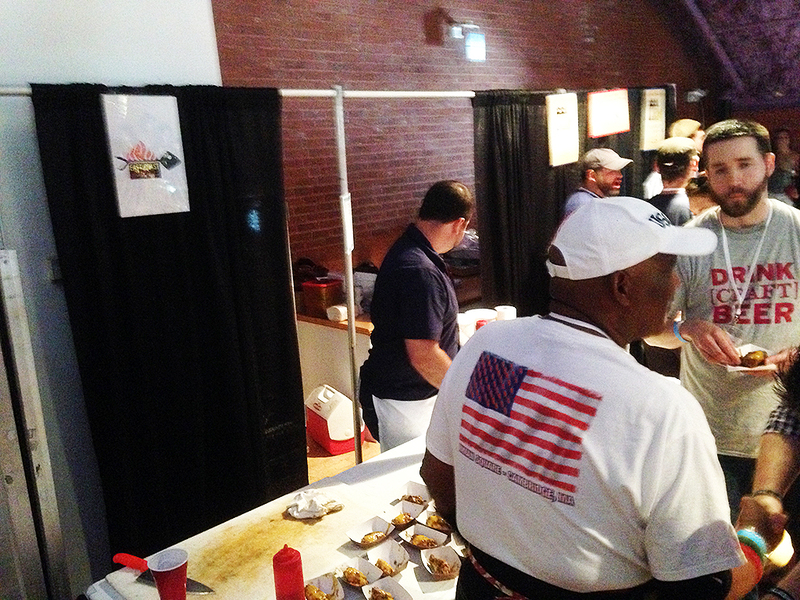 This is the first booth I saw at the Fest, which is fitting because it was also the best BBQ at the event by far! Truth be told, BT’s Smokehouse is the best BBQ that I’ve had in Massachusetts. I know that’s a big claim, but while there are some other decent BBQ places in MA, none of them really nail what’s happening down South in terms of BBQ like BT’s does. 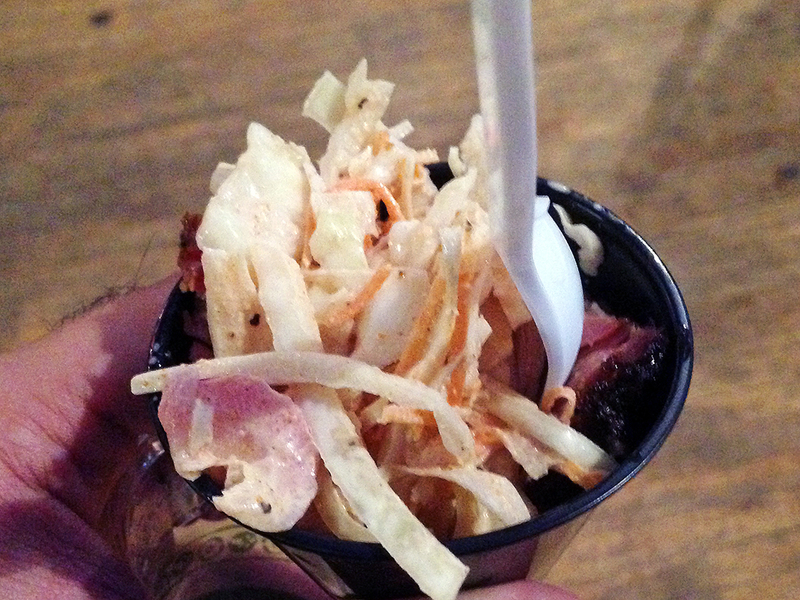 The sample at the booth was some pulled pork and mildly spicy coleslaw. The pulled pork was smokey, but not overly so and it had a good consistency that was solid yet tender. The coleslaw went excellently with it because of its crunchy texture, mild spice, and basic summery flavors. 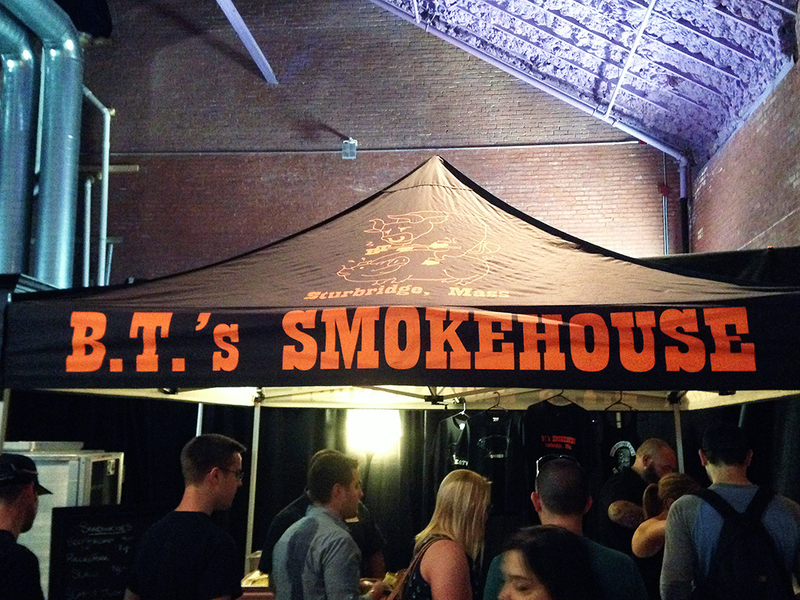 Another treat produced by BT’s Smokehouse was their house made beef jerky. I tried the spicy beef jerky, which really wasn’t too hot at all. The really mild head augmented the flavor of the meat rather than detracted from it. 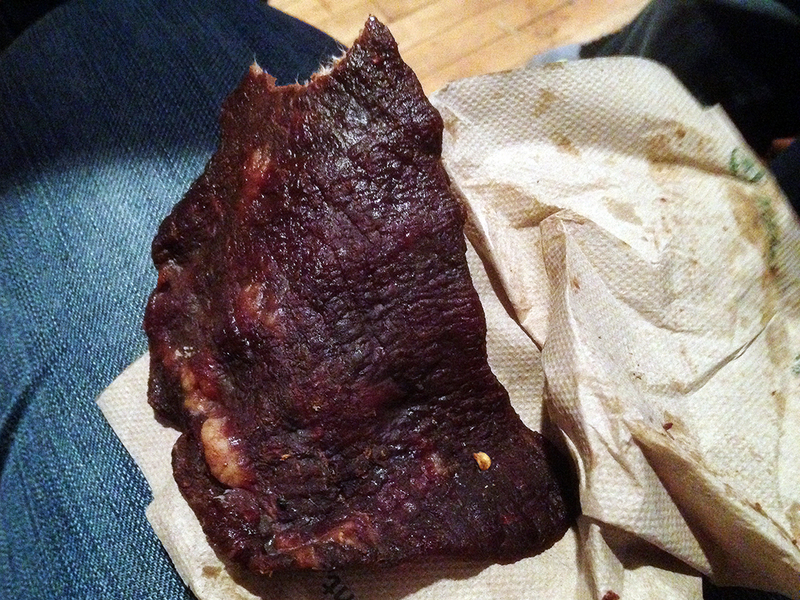 They served really large pieces of jerky too, which I was happy about. The texture of the jerky itself was a bit on the firm side and you did need to use your teeth to tear at it, but it wasn’t petrified or overly dry like some house-made jerky. 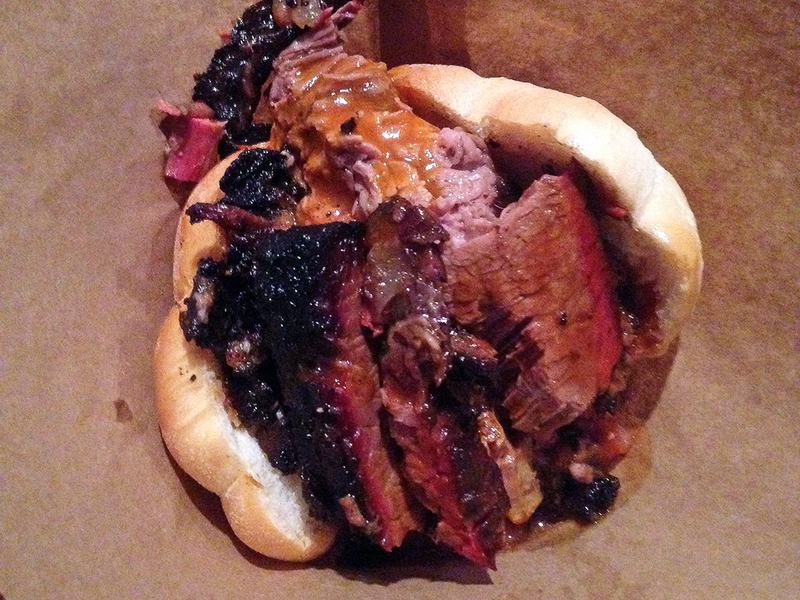 The true BBQ star of the day was the brisket sandwich from BT’s. When asked if I wanted a mini or a regular, I hesitated and almost said mini because I was already so full of beer from the tasting. Nonetheless, my sense of smell prevailed and I thankfully ordered the regular size. The brisket was masterful. It had crispy burned bits on the outside that contrasted perfectly with the tender and juicy meat inside. It was nothing like the terrible dry strips of brisket most places make with stringy pieces of fat attached on the side. This was truly exceptional. It had just the right amount of smoke and I just couldn’t get over how tender the meat was. The bread was really just a vehicle for the brisket, which they could have served on a trashcan lid and I still would have eaten all of it. The restaurant also had numerous sauces to go with their barbecue. All of them were really watery like a “Carolina” style sauce, but they contained excellent flavors that complemented the meat in different ways. None of the sauces overpowered the meat due to the thinner consistency, but the flavors of the sauce still shined through. There is some expertise in making a sauce like that as well. If my stomach could have handled the volume of another brisket sandwich, I would have easily had another one. I honestly want to say that I liked the food at East Coast Grill because the people working the table were awesome. One of the cooks was super friendly and made small talk with a lot of the people as they tried the food. Unfortunately, the wings and the rib that I tried were mediocre at best. 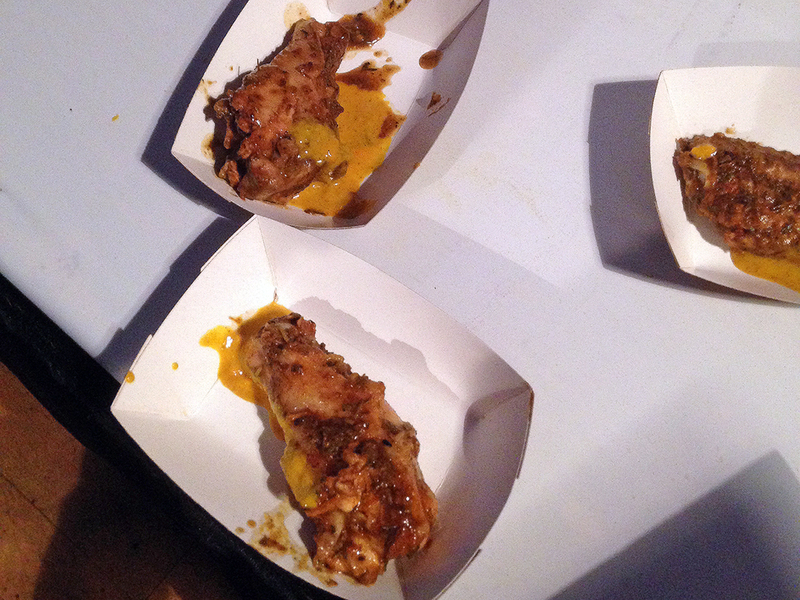 The wing was meaty, but also soft, which is a huge problem in my book. I prefer crispy wings even if they have sauce, so these fell short for me. The flavor itself wasn’t bad if you could get past the volcanic magma they doused the wing with. They called it hot sauce, but my mouth called it pure hellfire. I love spicy food, but this was just silly. Apparently, they make some dishes for Hell Nights (specified evenings where restaurants create horrifically spicy dishes for the brave of heart and iron of mouth). That’s a great and fun gimmick, but why a restaurant would introduce itself to people with a sauce that hot is just a mystery. The rib was just ok. My friend said it tasted like ham and that is an unfortunately accurate statement. The smoke quality just tasted like a store-bought ham. The meat was tender, but required some pull to get it off the bone. 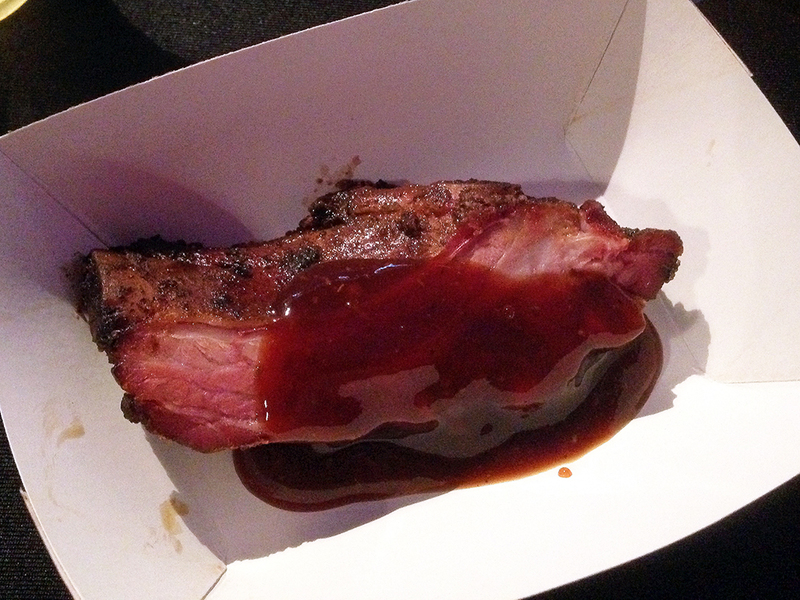 The plain BBQ sauce that covered the rib was unimpressive and a little too sweet. Overall, it wasn’t a terrible rib, but its not a rib I would order or seek out again. I don’t know what happened to Lester’s Roadside BBQ, but by the time I got upstairs in the venue to where they were stationed, no one was there. It seems like even though it was only 2:30 pm and the doors opened at 1 pm, they ran out of food or simply didn’t care to cater to the people at the fest for the rest of the session (or possibly the day). I didn’t get to try their food, which was a disappointment in itself, but if their poor preparation is any indication of their food quality, then maybe it was for the best. Bantam Cider Company – Founded in 2012, Bantam is located in Somerville, MA and all they make is brewed cider. I tried all three that they showcased and I have to say that this stuff is good. I don’t even really care for cider all that much, but when one of the representatives at the booth told me that the Americain tastes like Apple Pie, I was shocked at how much it tasted like apple pie. The other cider that rivaled the Americain was the Wunderkind, which was more sour and a little drier, but also exceptional. I was very impressed with Bantam’s offerings at the fest. 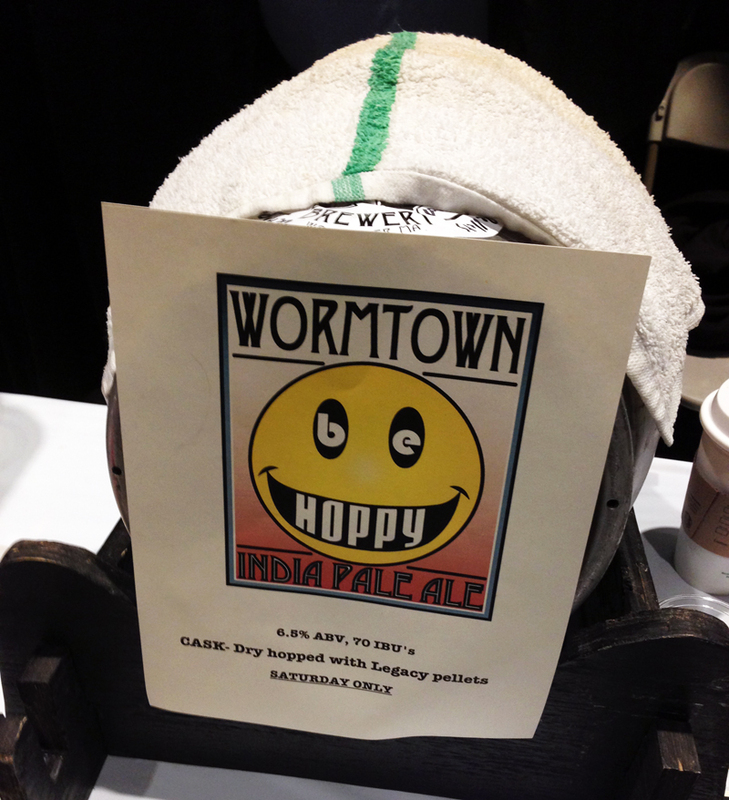 Wormtown Brewery – I became a fan of Wormtown (based out of Worcester, MA) after trying their “Be Hoppy” IPA a few years ago at a Drink Craft Beer fest. This time around I tried their “Be Hoppier” IPA and it was exactly what it sounded like – a hoppier version of their regular IPA. I also tried their Kola Nut Brown Ale, which tasted like smashed up Necco wafers in beer. It wasn’t my favorite, but it really did taste like cola in a way, so that was impressive. I’m so glad I discovered Wormtown even if it was late in the game and I love what they’re doing out there in Worcester! Harpoon Brewery – Many people know this Boston, MA based brewery and they have a wide distribution. Nonetheless, they are making my list of “new” beers because I had never tried their UFO Big Squeeze. I’ve had their UFO White and UFO Hefeweizen, but the Big Squeeze remained a mystery. This is basically a grapefruit shandy. 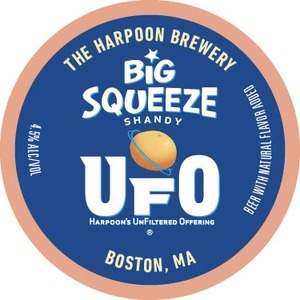 If grapefruit juice and beer had a baby it would be the UFO Big Squeeze. The grapefruit flavor isn’t overpowering and the dry bitterness of grapefruit makes this shandy style beer a bit more drinkable than its sweeter cousins. It’s a great summer beer to mix things up out of the norm of IPA overload. Smuttynose Brewery – Based out of New Hampshire, these guys know beer, which is good because the guys at the booth weren’t very friendly at all. They aren’t “new” to me as a brewery, but some of their beers featured at the fest were. 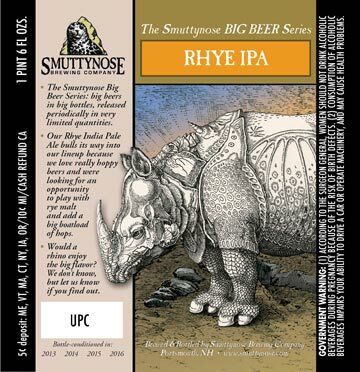 The Rhye IPA is a beer made with rye that really delivered on the usual IPA flavors and then some. It had just the right amount of balanced bitterness and the rye flavors made the beer a bit more unique. I also enjoyed their Kindest Find beer, which was a little malty and on the sweeter side, but it lived up to its name as a great find. 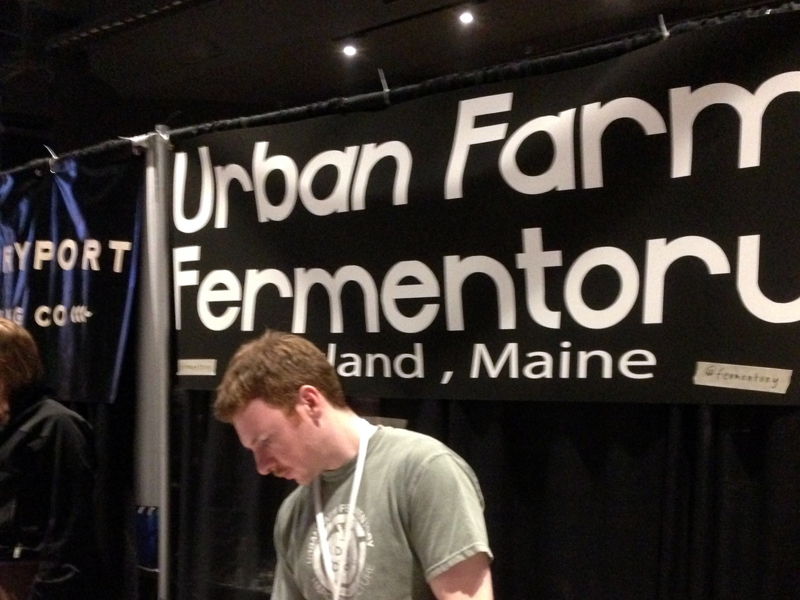 Honorable Mention – Urban Farm Fermentory – I have to admit that even though this brewery is from Portland, ME where so many other great breweries hail from, I’m generally not a fan. I don’t really understand what they are doing in terms of beer and I feel like a lot of their stuff misses the mark. NONETHELESS, I felt it worth mentioning that while still completely weird, their Seaweed Cidah was totally interesting and impressive in its own way. The seaweed cider tasted like the ocean, which sounds strange and it is, but something about the flavors really worked. I don’t think I could drink a whole glass of this stuff, but trying a little bit was fun and I was impressed that they got the flavors into the beer that they did. Ah! I’m so mad I missed this! !